I was excited today to see that alert emails from SharePoint Online are now looking a lot nicer. Alert emails have been consistently hideous since SharePoint 2003 days (and even earlier, most likely), so it’s great to finally see an improvement. 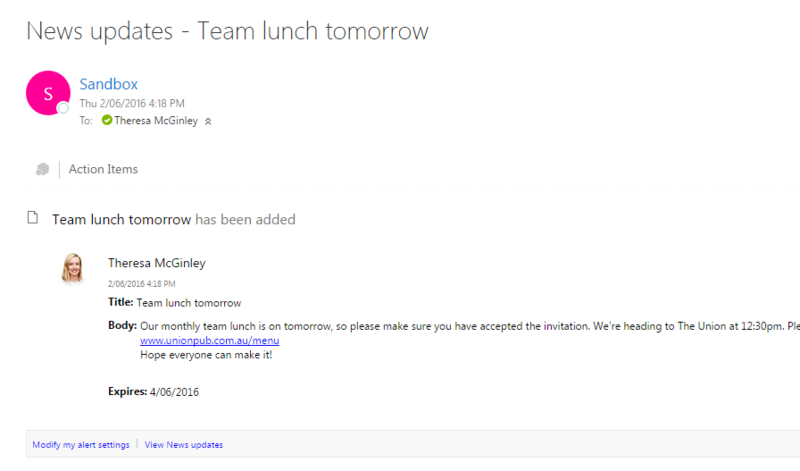 This is in Office 365 Outlook, but it looks pretty similar in Outlook 2010. As you can see the design is a lot neater and easier to read. It’s nice that the image of the creator is displayed, adding some sorely lacking visual interest. One issue is that the text doesn’t wrap, so I had to scroll to the right to see it all. Also, the link to the item in SharePoint is not very obvious – it’s that tiny blue text at the bottom of the email. But hey, it’s a small step in the right direction, so I’ll take it! Just for fun, let’s take a look back at what the alert emails used to look like… I can’t believe they have been this ugly, for so many years (actually, I can – it’s Microsoft, after all). From what I understand, Microsoft will be rolling out this change to Office 365 – SharePoint Online over the next while. So, if you aren’t seeing these improved alert emails yet, hopefully it will come through soon.